Junior Golfers come train with University of South Florida coaching staff Sunday, March 25th, 2018. The coaching staff will help elevate your game to the next level by spending a day with Head Men’s Coach, Steve Bradley and his assistant coach, Brad Caldwell. This camp is limited to the first 10 boy junior golfers. Campers receive written feedback based on 10 different areas of evaluation. South Florida Junior Golf Exposure Camp is for any junior golfer whose goal is to take their game to the next level. The camp is open to the first 10 boys to sign up. The one-day camp curriculum is designed to offer skill assessment and intense training for the competitive junior golfer. This unique one day experience will include all facets of the game and a simulated college golf practice; full swing, short game, putting, course management, sports psychology, nutrition, physical fitness, NCAA workshop, etc. You will play 18 holes of competition with Coach Bradley, and Coach Caldwell as they guide you through your round. South Florida Junior Golf Exposure Camp will keep a 5 to 1 camper to coach ratio in order to provide for a safe and highest-quality instructional experience. Camp is open to any/all entrants limited only by number, age, grade level or gender. Train with the Princeton University, Dartmouth College and Brown University head coaches on Sunday, March 4th, 2018 at the Leadbetter Golf Academy – Champions Gate in Orlando, Florida. This college golf exposure camp will help elevate your game to the next level by spending a day with head coaches, Will Green, Rich Parker and Mike Hughes. This camp is limited to the first 15 boy junior golfers. This Junior Golf Exposure Camp is for any junior golfer whose goal is to take their game to the next level. The camp is open to the first 15 boys sign up. The one-day junior golf exposure camp curriculum is designed to offer skill assessment and intense training for the competitive junior golfer. This unique one day experience will include all facets of the game; full swing, short game, putting, course management, sports psychology, nutrition, physical fitness, NCAA workshop, etc. You will play 18 holes of competition with Coach Green, Coach Parker and Coach Hughes as they guide you through your round. Parents are encouraged to participate in the development workshops with exception of the 18 hole competition. This Junior Golf Exposure Camp will keep a 5 to 1 camper to coach ratio in order to provide for a safe and highest-quality instructional experience. Camp is open to any/all entrants limited only by number, age, grade level or gender. 5 Questions and Answers about College Golf Camps of America. 1. Are all these colleges going to be there? I mean really? Yes, REALLY, the NCAA guidelines allow for coaches to work camps. So, over the past 5 years, we have contracted over 200 major college coaches within the NCAA guidelines…no different than coaches running their own camps, CGC is the buffet of College Golf Coaches at one camp….make sense? 2. Why do you only have BIG D-1 schools when I will probably play at a lower level? 3. How will the coaches see me play? Great question, coaches in attendance will be roaming the camp all day, from the range to the golf course. We will assign each coach a cart and 3-4 holes to per day. Those coaches will watch players come through their assigned holes each day. They will be assigned 3-4 holes on the first day and then 3-4 different holes the next. Having 18 coaches in attendance, every hole will have an overlap of coaches…..hence forcing them to watch campers come through so they can coach, evaluate, instruct, etc…..pretty cool huh? 4. Do my parents need to attend? Absolutely, it is the opinion of the CGC that the parents could get as much or more information from the camp as their son or daughter. Parents can do everything but play. They can rent a cart and follow their son/daughter. They need to attend the clinics. The clinics are full of big-time information from college coaches. These clinics are geared to educate the campers and the parents!! 5. Am I good enough? Is my handicap too high? This is a great question, but you and your parents are the only ones to answer it. We are open to all players of all skill-sets. This camp is geared for players who want to play college golf, period. Who are we to label a player and say they good enough? Don’t ever allow someone to label you. We believe in the process to gain results. Ultimately we can only control our attitude and our effort!! So don’t allow anyone to label who you are or who you will become!! Junior golfers seeking to take their game to the next level. College Golf Camps Junior Golf Exposure Camp curriculum is designed to offer skill assessments as well targeted instruction for competitive junior golfers. instruction, range balls, green fees and written evaluations. Design by golf course architect William F. Bell in the old style, with terrain completely natural. in his 12th year as USC’s men’s golf head coach, establishing himself as one of the top coaches in the nation with three consecutive NCAA Championships quarterfinal match-play appearances – including one final and one semifinal berth — among 11 straight trips to the NCAA Championships final week. Zambri’s teams have won 27 events (as of the end of the 2016-17 season), including conference titles in 2007 and 2011 and NCAA Regionals in 2008, 2012 and 2017. His 2015 team was a program-best NCAA Championships runner-up, followed up by an NCAA semifinal finish in 2016 and a quarterfinal appearance in 2017. His 2008 team came within three strokes of first place at the NCAAs. Trojan golfers have also won 23 individual crowns under Zambri (as of the end of the 2016-17 season). How can you improve your swing tempo? What are you currently doing now to improve the rhythm of your golf swing? Rhythm is the heart of every sport! Train your rhythm and personalize your ideal tempo to perform your best. What is Tempo in Motion? Tempo in Motion is the best Rhythm and Tempo System for Sports Training. We combine scientifically engineered music and tools designed to determine and perfect your tempo and rhythm. Our company has developed software and a unique system with the feedback and support of many sports professionals. Tempo in Motion also provides the only streaming radio for tempo and rhythm training. Find, analyze, and perfect your individual tempo and rhythm with our proven system that uses auditory click patterns and music tracks to sync your movement for any sport. Coaches and trainers work to strengthen the body and mind. Tempo in Motion is the glue that ties it all together. What are some of the benefits of Tempo in Motion? Future Champions Golf growth continues. 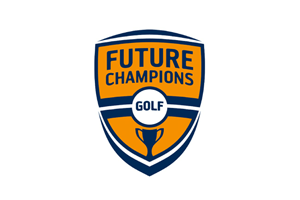 FCG, a key College Golf Camps partner is planning for new tournaments in Kansas, Canada and now names new tournament directors in Texas, Kansas, Northern California, Southern California, Northern Mexico, Arizona, Nevada and Canada. Founded by Chris Smeal, PGA in fall 2003, Chris has a passion for junior golf. FCG and Chris have become the experts in junior golf development and tournament hosts. FCG’s upcoming tournament now has over 500 junior golfers registered. Carlos is set to host the Inaugural FCG CBGA Texas Invitational in early summer 2018 in Dallas, TX. The event will be a qualifier for the FCG Callaway World Championship now annually played at the Westin Mission Hills. Stay tuned for more information about this special event and check out our other FCG Texas Tournaments here! Carlos has been involved with Future Champions Golf for many years now including bringing a team to San Diego for the Callaway Junior Cup event featuring Chris Smeal Golf Academy verses the Carlos Brown Academy. Carlos sends his players to several of the annual FCG Tournaments. TJ Atley named tournament director in Canada. Greg has hosted FCG events in Northern CA annually for 4 years and will be bringing more events to different areas over the next several years. These events will expand our National Tour, create more opportunities for players to qualify for the prestigious FCG Callaway World Championship, and much more. Vincent has been with the Future Champions Golf staff for over a year and has excelled in becoming a Tournament Director. Vincent will oversee development of key events in Nevada and Arizona as well as the San Diego Kids and One Day Series Events. Meet Vincent next week at the FCG Arizona Championship being played at Ocotillo Golf Course! Vincent will work alongside FCG Director of Operations, Antrone Williams. Maranie has been a driving force behind the Tournament Program for Future Champions Golf for years and now will be responsible for overseeing all Southern California events throughout all the levels of the program. She will work directly with Antrone Williams, Director of Operations on all facets of the tour. FCG will be hosting an event in Tijuana, MX in 2018 with the support of the Tijuana CC and host Ricardo Montemayor. Josh is set to host the inaugural FCG Kansas State Championship in Spring 2018 with the top finishers earning a spot in the 2018 FCG Callaway World Championship! FCG’s tournament headquarters and golf academy are located at Stadium Golf Center in San Diego, CA. Here is one of our favorite golfers of all time, Stan Utley. Mr. Utley and his son attended one of our junior golf exposure camps in Dallas. We talked about many many aspects of junior golf. One topic of discussion was “how do we get junior golfers to release the golf club?”. Further discussion brought us to the Orange Whip. Mr. Utley firmly believes the Orange Whip naturally creates lag in the golf swing. Thus creating a release of the golf club. Listen to this great video with Mr. Utley. Designed exclusively for juniors, the lighter weight and shorter length of the Orange Whip Junior, allows junior golfers to feel if they are maximizing their swing tempo and balance. The orange ball replaces the clubhead and allows you to focus on swinging naturally without worrying about the position of the club face. It’s weighted to promote a fluid swinging motion rather than a jerky hitting motion. Our proprietary shaft naturally promotes the need to swing in rhythm creating synchronization between your arms, upper body, and lower body. The result is a perfect tempo and balanced swing creating more consistent and powerful shot-making on the course. One of the best and often overlooked features of the Orange Whip is the ability to use it indoors without compromising its unparalleled performance. It only requires a minimal amount of space and 5-10 minutes of training time per day. No golf swing trainer is more time efficient and effective. You can work with an Orange Whip year-round and never again have to depend on weather conditions or daylight when you want to improve your golf swing and fitness. It’s the ideal tool for those living in challenging winter environments and busy individuals with little time to practice. With an Orange Whip, anyone can make the most out of the winter months and improve without hitting golf balls. If a golfer trains their swing without using a ball, the mind and body will allow the swing to develop naturally. The Orange Whip can eliminate the ‘hit’ instinct from your mind and consistency can be developed. All competitive golfers are looking for any advantage to maximize their scoring potential during tournament play as long as it’s within the rules of the game. You can do this yourself. That’s right, you can create a game plan with a DIY yardage book. 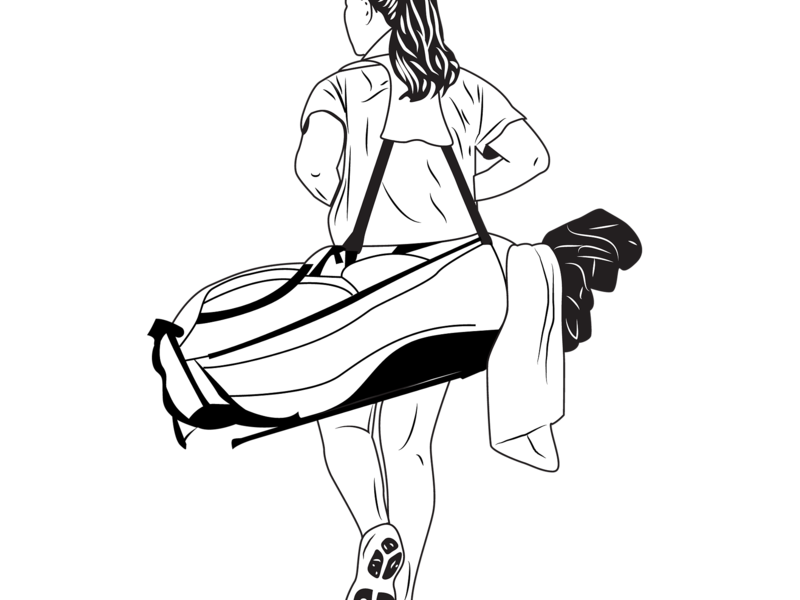 After several years as a parent of a junior golfer, Michael Carter and his daughter Larissa created a do-it-yourself yardage book company called Go To Caddie. Since it’s inauguration in 2015, Go To Caddie yardage books are being used by professional and junior golfers around the world. In addition, their My Caddie Pro yardage book has been incorporated into top college golf programs throughout the country. A yardage book is an essential tool that all professional golfers and caddies use when taking notes prior and often during practice rounds before a tournament. In the past, both player and caddie would spend hours familiarizing themselves with the course design. Now with new internet technology, they can design their yardage books from home allowing them to have accurate measurements throughout the course prior to even stepping on the first tee box. DO IT YOURSELF with Go To Caddie Excellent stocking stuffer for Christmas!! The My Caddie yardage book is designed for rising junior competitive golfers. Yardage books can help eliminate costly mistakes and erase any doubt from a player and caddie’s mind by servicing them both with their own accurate information and game plan. This gives a mental edge to a player by having confidence over every shot. 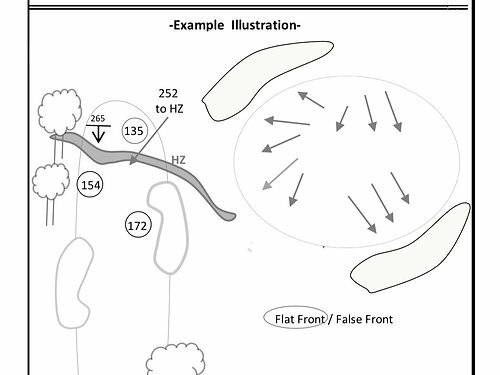 These notes can provide accurate yardages for distances from the tee box to hazards and landing areas in and around fairways and on the green. A yardage book is a definitive tool for course management and a critical piece of equipment for the modern game. 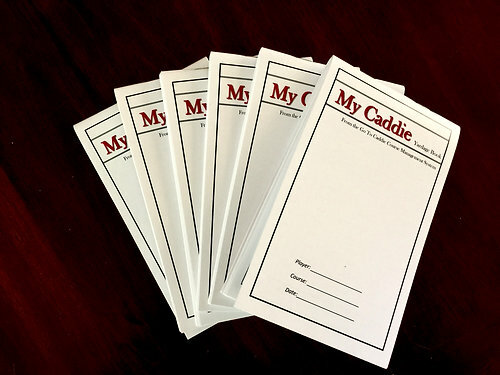 The My Caddie yardage book is designed for juniors competitive golfers. It has a saddle stitch binding with a club yardage chart and when the book is flipped open, its 40 pages for all 18 holes. The course template is already drawn in so all hazards and notes are completed by the player or caddie during practice and tournament rounds. 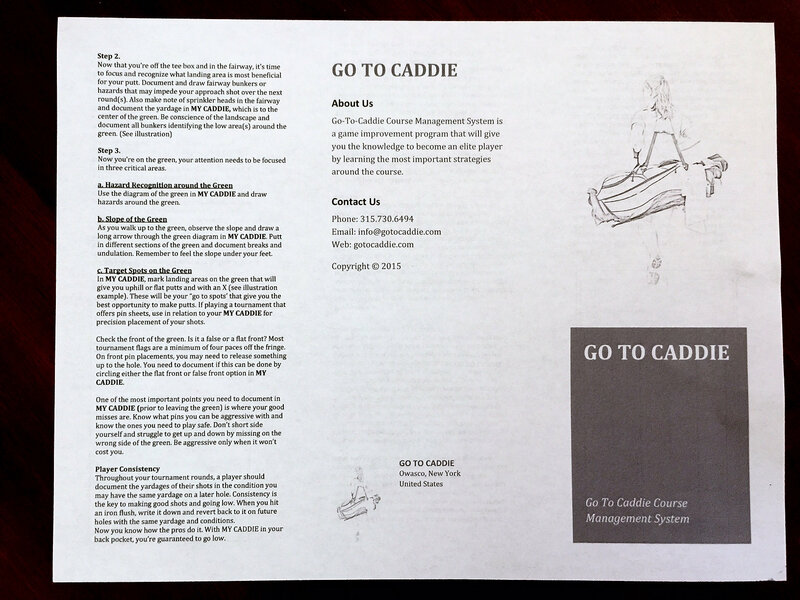 This also includes an instructional tri-fold that will not only walk you through the process of diagramming each hole, but it also gives you tips on how caddie and player manage their round. This system also offers tips that pro’s use in every tournament.